Building on the “remarkable progress” made in Kosovo during 2013, particularly with regard to local elections, both parties must consolidate “the critical achievements”; Pristina and Belgrade must continue their dialogue to reach regional reconciliation, stability and prosperity, the top United Nations official there said today. “It will be essential for Belgrade and Pristina to consolidate the historic progress achieved thus far, and to overcome, gradually but steadily, the many outstanding issues through dialogue,” UN Secretary-General Ban Ki-moon’s Special Representative, Farid Zarif, told the Security Council. Mr. Zarif, who was presenting Mr. Ban’s latest report to the 15-member body, heads the UN Interim Administration Mission in Kosovo (UNMIK), set up in 1999 to run Kosovo after North-Atlantic Treaty Organization (NATO) forces drove out Yugoslav troops amid deadly fighting with the majority ethnic Albanian population there. Kosovo declared independence from Serbia in February 2008, but Serbia does not recognize the declaration. In April 2013, Pristina and Belgrade reached a European Union (EU)-facilitated Agreement of Principles Governing the Normalization of Relations, leading in November to largely peaceful mayoral and municipal assembly elections that for the first time included four largely Serb northern Kosovo municipalities under a single legislative framework, although the post-poll establishment of the new administrations there moved at a slow pace. “An essential basis for this progress has been an increased level of mutual confidence and direct communication between the parties, which has been sustained regardless of the disagreements and disputes over the details of implementation,” Mr. Zarif said. He noted also that nearly 150 Serbian police officers have completed their induction and transition to the Kosovo police, with another 100 officers completing the process and assuming duties in the North by the end of this week. But work still remained to be done regarding the judiciary in northern Kosovo despite some progress. “Flexibility should be demonstrated by both sides on such future arrangements as [this] would ensure maximum access to justice and promote broad public confidence in the system,” he stressed. “Building greater confidence in the police and judiciary throughout Kosovo is of the highest importance, especially as implementation proceeds in northern Kosovo,” where, he said, the recent killing of a newly-elected member of the North Mitrovica municipal assembly remains unsolved. In his report Mr. Ban praises the “strong leadership and commitment” of Belgrade and Pristina that culminated in the April agreement and stresses the importance of continuing the dialogue. He calls on the international community to continue to encourage and actively support the dialogue process by assisting the newly elected local municipal assemblies and leaders, including in northern Kosovo, to demonstrate the peace dividend through the early progress of their constituencies. “It is essential to ensure that the future benefits for all involved municipalities, south and north of the Ibër/Ibar River (a geographical divide between ethnic Serbs and ethnic Albanians), are accrued through well-coordinated local and international efforts,” he says. 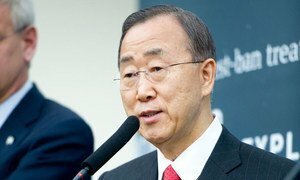 Welcoming the peaceful conduct of local Kosovo elections, United Nations Secretary-General Ban Ki-moon today called on all actors to build on the success of the polls and to continue to constructively in the European Union-facilitated dialogue on normalizing relations between Belgrade and Pristina.